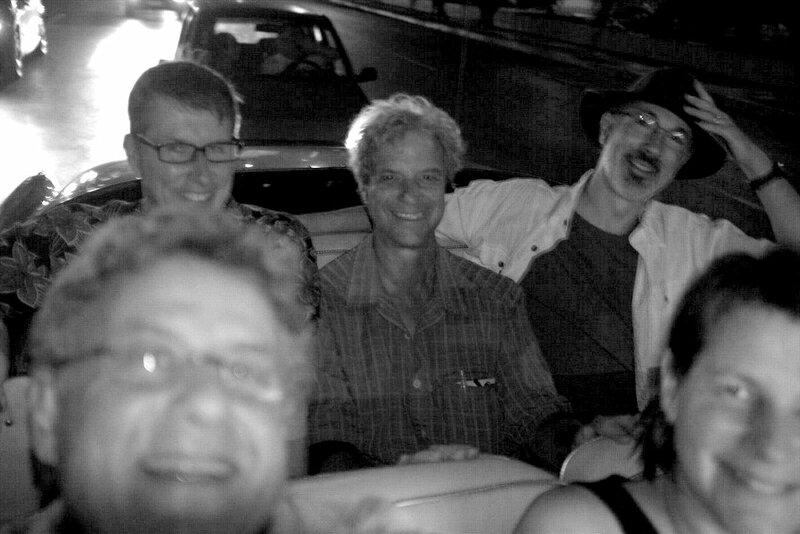 It’s somewhere after midnight, and the third meeting of the Havana Haiku Club is in full swing out on the Malecon. As is the Malecon. 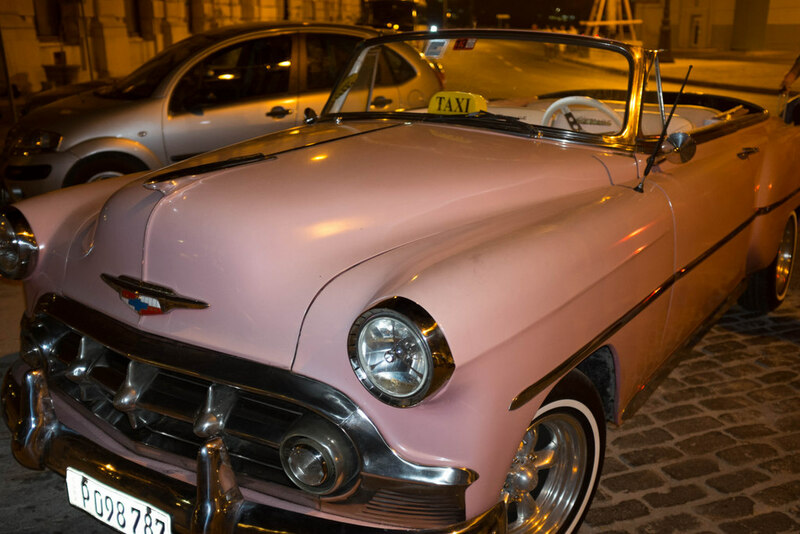 Four of us remain from the gang who ventured back into the old city for dinner, stuffed into a gorgeous hot pink 1953 Chevy land yacht with the top down and salsa turned up, rolling through the Havana night like it was on fire and we were all brand new. Over the years, memories of a place tend to wash away, leaving only a handful of moments, hard and sharp like a bright stone glittering in the stream of time. This, we knew, was going to be one of those moments. 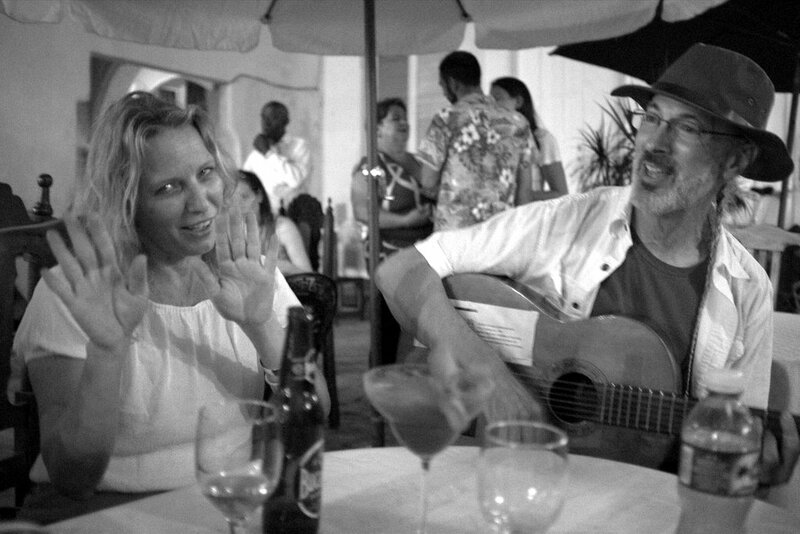 Far into our dotage, when we remember nothing else of our travels, if someone were to whisper the name “Havana” into our ears and detect a faint, faraway smile, this is where they will be able to find us. But that was hours ago. Since then there were cobblestone rambles from plaza to plaza trying to settle on a paladar (non-state-owned restaurant) that met everyone’s rapidly-declining standards. We reached a minimum common denominator at a spot near the end of the alley just off Plaza de la Catedral (it’s late, we’re here, and they can seat us all approximately together). Devon, Paul and Nancy took what, as the evening progressed, we started referring to as the “grownups’ table” after Malia took a couple of rolled up paper tubes from the peanut-selling lady, stuck them into her mouth and said “Look – I’m the walrus!” Granted, I may have tucked a pair of them into my glasses like rabbit ears first, but one point only gives you a benchmark – you really need two separate incidents to tell that things are going downhill, and how quickly. Dinner was tasty, if a bit tardy, with a bit of a dispute over the number and source of drinks served. The proprietor had taken it upon herself to assume that when Jeff asked for rum, he meant the crazyexpensive 24-year-old-distilled-from-elysian-sugarcane kind she kept in the back room. The assumption only came to light when the bill arrived with about $75 more on it than we’d calculated; there was some contention, some indignant defense, but in the end we decided to just pay up. So we were overcharged. So we won’t be back. We’re here for Art, and Art demands at least a little suffering, doesn’t it? It was just under three miles back from the Plaza to the Hotel Nacional, best traversed on a broad coastal promenade known to all as the Malecon. What “Malecon” means, I have no idea. But when the sun goes down, the Malecon is where the city’s kids head to see and be seen. To hang out and drink. To try and impress each other with one of the surprisingly large number of guitars-per-kilometer that are worn here, usually slung over the back like some bandito’s rifle. “The grownups” set about hailing a cab, but Jeff and Erin hatched some sort of plan to walk back for reasons that seemed entirely unclear, even to them. Stormie threw her lot in with the grownups, leaving me and Allen to choose sides. 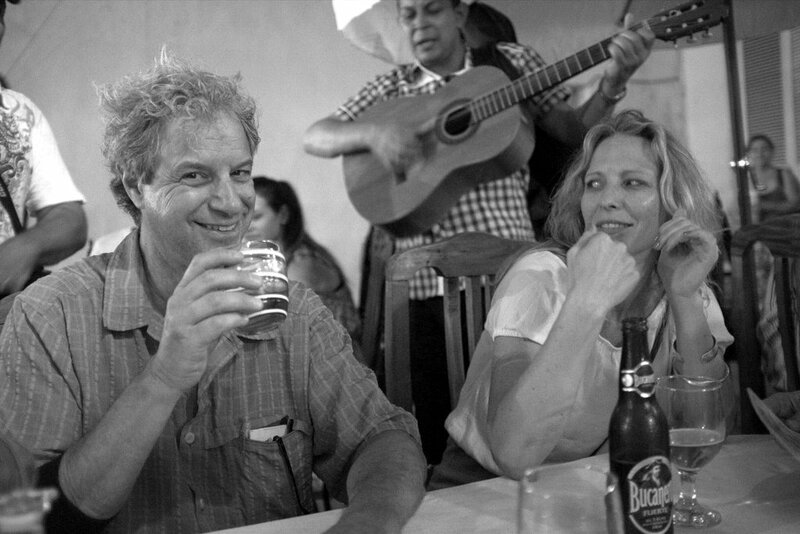 Hell, we were in Havana, and it was midnight. Why not walk? By day, the Malecon reads like an unrolled version of the city: gorgeous centuries-old architecture starkly punctuated with 1950’s modernism. Arching cannonades and culturally-repurposed colonial monuments (the Maine memorial laments the sailors “whose lives were sacrificed to voracious imperialism”). Alida Diez Sanchez, a Franco-Cuban architect who briefed us on Havana’s history tells us that almost 80% of the architecture is original, but 90% of it is in danger of collapsing. The danger is not exaggerated in the least: there are an average of three collapses each and every day. Sure, Alida says, they could level everything and replace it with cheap, quick-build high-density housing, but… she leaves the rest unsaid: would future generations lament the loss of a 500 year old city like we lament the library of Alexandria? Tonight we’re not thinking about any of that. Tonight, we’re just letting ourselves get lost in the moment, another moment, with the kids out on the Malecon and a cool wind coming off the midnight sea. As we walk, Jeff declares that we have quorum for the Havana Haiku Club. Apparently this is the third meeting for the august organization, its sole purpose being the documentation of our group’s adventures in the quirky 5-7-5 syllable form whose cultural appropriation probably makes Japanese poets wish they’d never opened the country to Perry’s fleet. It’s probably best that, the next bleary morning on the bus, none of us can remember more than a couple of lines from any of our wittier contributions from the walk. But I can tell you we were legendary. Some previous nights, I understand, these walks were punctuated by stops to share a bottle of rum offered by some of the locals, and to have a go at singing along with a couple of kids waving a guitar. Tonight, though, we’re just walking. I’ve put the Panama hat up on the shelf for the evening, and my customary brown fedora draws a couple of approving calls of Indiana Jones! – I do my best to give an at-your-service bow, and they respond with applause. There is an invitation to join a cluster of teens in some sloppy but enthusiastic rendition of a Spanish rap song. A couple of us dance-shuffle to the beat as we pass to show our appreciation, but by now, I think we’re all tired. Someone suggests a cab, and before we can reach consensus, Erin waves her hand in some magical gesture toward the curb. Out of nowhere, a yellow taxi materializes and glides to a stop, awaiting our command. But really, it’s only a few more blocks, so we decide to tough it out after all, and do our best to convince the now pouting driver that it was all a mistake, and that we’re sorry. There are more haikus as we traverse the final stretch, lamenting the fickleness of life and extolling the value of good walking shoes. It’s close to one in the morning, and things out on the Malecon seem to be just heating up. Isn’t this, like, a weeknight? Don’t these people have work, or school, or something? We let the question drift away into the night. At the corner, a young man in cutoffs and a tank-top has upped the ante for street ballads and is thumping away on a full-sized upright bass. We cheer him on – who wouldn’t? Five more minutes and we’re at the steps of the Hotel Nacional; the evening, and the third official meeting of the Havana Haiku Club, are now incontrovertibly over. Jeff promises he’ll try to write a couple of them down, but we’re already struggling to remember how they went. Wasn’t there one about shoes? Gone with the dawn. Whew.